To free the steering, turn the steering wheel slightly at the same time as turning the key, avoiding any undue force. Release the key as soon as the engine has started. Never turn to this position when the engine is running. 1. Selecting/stopping the cruise control mode. 2. Setting a cruising speed/Reducing the value memorised. 4. Setting a cruising speed/ Increasing the value memorised. To be memorised or activated, the speed of the vehicle must be above 40 km/h (25 mph), with fourth or higher gear selected on a manual gearbox (second in the case of 6-speed EGS or automatic gearbox). 1. Selecting/Stopping the speed limiter mode. 2. Reducing the value memorised. The gearbox operates in auto-active mode without input on your part. Do not select this position, even momentarily, when the vehicle is moving. Push the lever forwards to change up. Pull the lever backwards to change down. Under heavy acceleration, a higher gear will only be engaged if the driver operates the gear lever or the controls on the steering wheel. 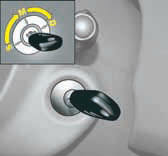 Press the "+" or "-" control paddle behind the steering wheel for an immediate gear change up or down respectively. To aid starting on a gradient, your vehicle is equipped with a system that keeps it temporarily immobilised. On a rising gradient, with the vehicle, stationary, the vehicle is held for a brief moment after releasing the brake pedal, if you are in A or M.
On a falling gradient, with the vehicle stationary and reverse gear engaged, the vehicle is held for a brief moment after releasing the brake pedal.